« A new tube amplifier on the market ! Ok. So how about pre-forming our signal capacitors PRIOR to putting them into the signal path? Instead of waiting hundreds of hours, with the signal capacitor placed within the signal path of your audio equipment, how about pre-forming it with a dedicated and unobtrusive device, one that shall not interfere with your quality listening of your quality music in your “current configuration” ? The setup uses a typical separation transformer, ie. with 115 VAC on the output, equivalent to a peak voltage of 162 V at the dip of the half-wave rectifier. The R1 resistor serves the purpose of limiting the maximum current of the forming device, but at the same time has an influend of the rising slope of the capacitor charging graph. Note that the rectifier is a half-wave one, but with essentially no filtration after the diode. This basically means that the jagged voltage is forwared via R1 to the capacitor, which sees this as a superposition of two components … A steadily rising DC voltage, with an additional and strong AC ripple component upon it. The concept stems from the premise that we do not listen to our audio equipment 24 hours a day. Therefore, the waiting time for our signal capacitor to “settle down” and “arrange itself” would be long, sometimes even extensively long. Most Audiophiles are impatient, so it is always hard to wait for this process to happen when the signal cap is already soldered into the insides of our audio equipment. It would be much better, if we pre-form it, or pre-arrange it, by using a simple, but external device, independent of our audio rig. Such a Turbo Forming Device for capacitors could be connected to the mains constantly, providing 24/7 forming of our signal cap. Day In, Day Out. So, as bizarre as it may seem, I see the potential for such a “faster pre-burn-in” device for signal capacitors, allowing to “pre-settle” them, before I actually put them into my signal path. Capacitors are somewhat “funny” devices. t is a well known fact that some of them have microphonic effects, including, yes, electrolytics sourced from renown and respectable companies, the names I which I shall not mention. Still other capacitors constitute great loudspeakers. Specifically: electrostatic speakers. In the electrostatic speaker, you have a fairly “large” distance (comparatively speaking) between the electrodes of your music-playing capacitor (more precisely, two capacitors placed in tandem) within your electrostatic speaker. The music is there. You can listen to it, as the middle membrane of your electrostatic speaker sways with the rythm of a couple of kilovolts, whereby the dielectric is simply air (with a dielectric constant of roughly ~ = 1.0). If you do not believe that capacitors may constitute microphones, simply tap one of the electrolytic capacitors within your preamplifier. If you do not believe that capacitors may constitute loudspeakers, simply visit the web page of a company such as Martin Logan and refresh your memory as to how they actually build their speakers. Hence, I gather, if we use thin films, thin dielectrics, for the production of present day foil based capacitors, and such thin dielectrics are made of modern materials (mylar, polypropylene, polystyrene, etc., etc. ), materials which exhibit a very high voltage resiliance, endurance, exhibit a high degree of insulating characteristics, all this results in High Voltage capacitors produced out of fairly thin films of dielectric. thin dielectrics that can withstand a possibly large potential voltage difference between the electrodes of the capacitor, with the dielectric in the middle, between them. Such properties of the modern dielectric materials are a “nice-to-have”, as they allow to achieve a greater capacitance density – a greater possible capacity that is achieveable per unit of volume of the final product, the final capacitor. But a difference in potential on two opposite electrodes means that (just as it was the case in the electrostatic speaker) the dielectric is being squeezed by mechanical force of the surface charges distributed upon those opposing electrodes. To say it plainly and bluntly, the dielectric is most probably exposed to mechanical forces. The forces that are really there. The surface charges interact realistically, and result in specific mechanical forces, which can be measured in Newtons per square centimeter of the surface of the dielectric. Yes. These forces compress the dielectric film. I mean, if there is a difference of voltage potentials on the conductive electrodes, and the distance between them is small, due to the fact that the dielectric is THIN (actually, VERY THIN), the more so these mechanical forces come into play and have a “say” upon the behaviour and structural stability of the capacitor as a whole. The surface charges upon the electrodes exert mechanical force upon the dielectric. Possibly in a somewhat different degree in the case of the outer windings of the capacitor (larger diameter, bigger surface area …), as opposed to the inner windings, of a smaller radius. The whole intestines of a capacitor are subjected to certain mechanical forces, to mechanical “flexing”. The effect of all this is that when a capacitor comes “straight” from the factory, it tend to sound awful. Experienced time and again by many an audiophile. Therefore, it has been observed by audiophiles, that if such a signal capacitor is introduced into the signal path, it takes tens to hundreds of hours, after which it “settles down”, do that the quality of the sound can “open up”. Maybe this has to do with the mechanical flexing of the dielectric within the intestines of the cap. Maybe it is simply a matter of eliminating the uneven tensioning of the dielectric within the roll. I once had a cassette deck tape recorder, which had a slight malfunction. The tape pickup / winder roll, the one that took the tape distributed by the quartz controlled capstan with its rubber roll … it did not work evenly. Although this black rubber roll continued to work evenly and forwarded the tape, with the music nicely playing in playback mode, the cassette with its “front” winding reel appeared to be rotating unevenly. Visible to the naked eye, with bizarre vibrations. These vibrations translated into an uneven tensioning on the tape “wound” upon the pickup roll, which resulted in that the whole roll was somewhat scewed. Unevenly wound, despite the fact that the tape-delivering device (the capstan) gave an absolutely even and quartz controlled linear speed of the tape. Small differences, variations in torque at the front of roller resulted in vibration. And these vibrations translated into a mis-aligned roll of the receiver winder. Unevenly wound tape. In some places it had excessive tensioning, and much weaker tensioning in other places. To make a long story short, after 45 minutes of playback of an extended play, C-90 cassette, from end to end, the quality of the pickup roll and the tape “wound” upon it simply cried for mercy. If a capacitor winding machine has some small deviations in the tensioning of the winding roll, similar phenomena may take place during capacitor production. Ah, yes. The schematic. You might be wondering what that funny element is. Of course it is a trisil, a specific silicon “crowbar” device, as produced by STM. 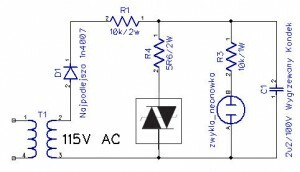 A neon bulb or zener diode would NOT provide you with the desired effect, being a rapid shorting of the charge upon the capacitor, once the voltage level reaches the triggering point. A neon bulb, obviously filled with neon gas, would give the result of nothing less than a very neat 77V voltage stabilizer. A tube zener diode, if you will. But we do not want to “stabilize” the voltage at reaching the threshold point. What we want to actually do is to short-circuit it. A Trisil does just that. 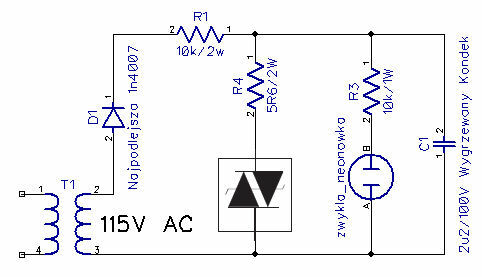 Once it reaches the ignition voltage, it effectively behaves as a short circuit and hence quickly empties the capacitor of essentially all of its charge. The voltage on the cap falls down. Quickly. Very Quickly. Almost to zero. And then the trisil “resets” and stops conducting. There the “loading process” beings again. Essentially, what we shall be dealing with, is a saw-tooth type of graph of the voltage upon the terminals of the capacitor. A saw-tooth with a slowly rising “loading” edge, and a very quickly descending “discharge” edge. Of course, we could use a low voltage version of a flash bulb, but such to not exist. The Trisil device is the easiest way to simulate a voltage threshold triggered “crowbar”. The trisil device operates very similarily to a combination of a diac in combination with a triac. 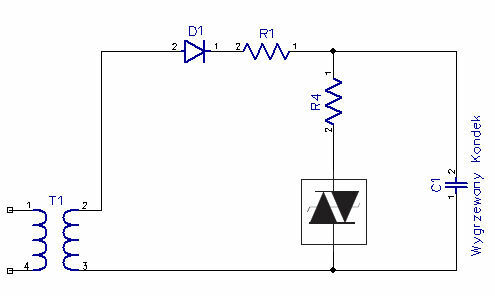 The first resistor, series connected just after the rectifier diode, has a specific resistance. This resistance, when combined with the capacity of the capacitor subjected to the forming process, determines a time constant for the leading edge / the “charging” edge of the saw-tooth voltage graph. Some ammendments need to be made to accomodate the pulsating nature of the half-wave rectifier with it’s jagged charging voltage. Let us assume that the Capacitor subjected to “forming” is of a value 2.2 uF /250V. Assuming a secondary winding of 115VAC, we get 162 volts of a peak voltage. Let us further assume that the peak current of the device shall not exceed a reasonable 16.2 mA. Hence this first resistor may take the value of 10K. This would correspond to a time constant of 0.138 for our leading, charging edge of the saw-tooth, which is equivalent to a frequency of 7.23 Hz. Such a frequency is low enough, so that if we use an additional neon bulb with resistor, attached to the capacitor terminals, we could possibly get a blinking neon confirmation that the device is operating as intended. The flickering of the neon bulb signal proper operation of the device. a) it limits the maximum short circuit current flowing through the Trisil to no more than the allowable limit, maximum surge current. For example, that could be something like 50A limit for a thread-through-hole (THT) type device. Assuming further a Trisil with a trigger threshold at 100V, this would mean that a resistor with a value of eg. 2.2 Ohm would do the job well. b). the very same resistor sets the time constant for the “discharge” slope. The time constant for the falling voltage edge upon the 2,2uF capacitor, discharging via 2,2 ohms resistor, would be: 6.28 x 2.2 R x 2.2 uF = 3,041×10^(-5). This corresponds to a base frequency of 32.8 kHz. If you think that this base frequency is too high, then you just simply need a correspondingly increase in the value of the resistor, to knock this time constant down. This is a version with an integrated neon lightbulb, which signals that the device is in operation. The neon bulb will be flashing at a rate slightly lower than the 7 Hz as mentioned earlier. 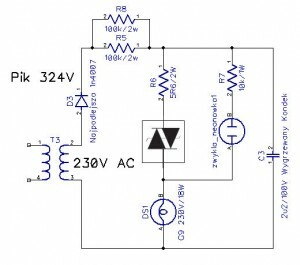 This version is one that incorporates an integrated CD polarizing component, a DC voltage that is present on the capacitor. Upon that DC voltage, there is the superimposed saw-tooth AC signal as generated by the trisil. During the activation of the trisil, the discharge current heats up the filament of the lightbulb, hence a voltage drop forms on this bulb. This voltage drop is the reason why the trisil deactivates earlier, comes back in to non-conductive state, although the charge upon the capacitor has not been fully depleted. 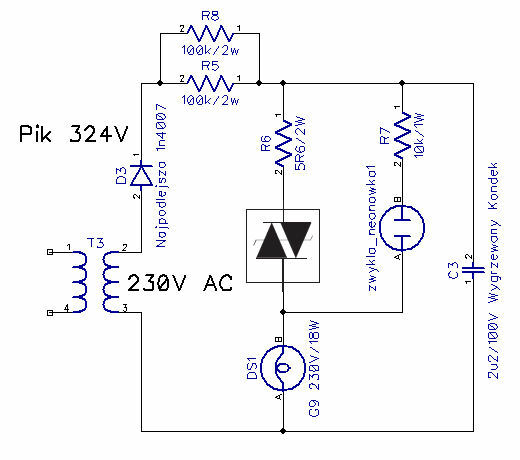 Therefore, after a few cycles, the DC component steadily builds up on the capacitor and is maintained at a level commensurate to the voltage drop that develops on the bulb during the discharge current pulses. For this last scenario to work properly, the trisil ignition voltage needs to be much higher, prefferably within the 200 – 300V range. Obviously, this version of a burn-in device is only suited for capacitors with a much higher voltage rating (forget the erroneous “100V” as depicted on the last drawing). Due to higher operating voltage, the series resistors have been replaced with two parallel connected 100k / 2w resistors. The neon signal bulb prevails, as we are not fully sure if the filament based PTC termistor bulb will actually heat up its filament to a degree that it would actually be useful as a visible indicator. So, basically, in a nutshell, this is a presentation of a “Turbo Signal-Capacitor Forming Device”.